I'm sharing this deluxe travel size, award-winning, anti-aging regimen to restore skin's protective barrier while on-the-go. 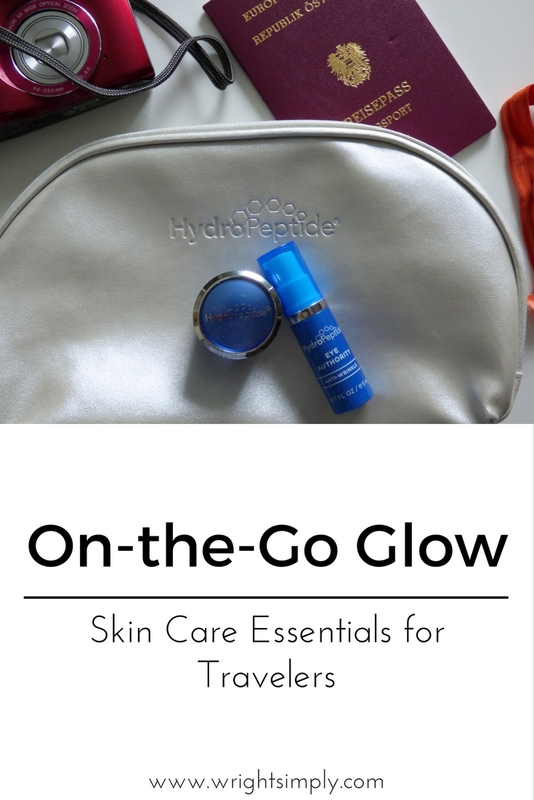 As someone who travels frequently and spends too much time on my skin and anti-aging, HydroPeptide On-the-Go Glow set is one of the best. And it makes keeping up with my skin care routine easy while out of the house. This travel set is full of all the essentials for travelers to keep their skin glowing while on the go. This set includes Exfoliating Cleanser, Pre-Treatment Toner, Face Lift Moisturizer, Eye Authority, and New Beauty Magazine winner Purifying Mask. Whereas I have enjoyed using all of these products, my favorite for sure is the Face Lift Moisturizer. It smells great, keeps my dry skin hydrated all day, and slightly tightens my skin, making my face look refreshed and healthy. I struggle with dry skin, which can make wrinkles look worse, so any products that help that from happening is a plus. And if you have ever traveled or flown causing your skin to dehydrate, then this is the stuff for you! Whether you're on the go or wanting to pamper yourself at home, the On-the-Go Glow set is just the skincare line to take your skincare routine to the next level. Have you tried any HydroPeptide products before? What do you use when you travel? I'd love to know! I would use just because of the presentation and the look of the bottles. I've never heard of this brand but will look into it. Thanks for sharing! This looks really cool! I love travel sizes anyway because I like to sample new products, but I also love the convenience of just being able to throw it in an overnight bag! I haven't heard of this brand but it sounds great! It's always tough to find travel size of your favorite items! These are great! A perfect read for me before hitting the road next week. These look like awesome products!! !